philosophy, let's get rid of it. It's even worse than the novels. The others are all idiots." he has freedom of choice. year, long dresses next year. it was just the urge to write. Ah, critic's prize. This is a good one. on his side. Lucky fellow. this country, on an average each year? bound to win some prize someday. like that because of his man, Friday. The Jews didn't like Nietzsche. Now, here's a book about lung cancer. so for everybody's peace of mind, we burn it. profound. The Ethics of Aristotle. he's a cut above anybody that hadn't. You see, it's no good, Montag. We've all got to be alike. for everyone to be made equal. so are you actually reading this, or did you just feel like farting some more? Jews don't like Nietzche? That's news to me. Why? I read his 'On The Case Of Wagner' and other things by him and he seems pretty critical of anti-semitism. For college I have to read Jane Eyre. Wish me luck! Last edited by BBP on Sun Jan 27, 2008 3:35 am, edited 1 time in total. people probably assume it because Nietzche was erroneously linked with the rise of nazism. Some people seen his philosophy through misinterpretation as influencing the rise of the far right in germany. Ridiculous. I personally really like Nietzche, so it bothers me that he seems to be so frequently misunderstood. I never actually finished 'Zarathustra'--by the beginning of the second book the style's imitation of the Bible was starting to really bother me--but when I was reading the prologue I was shocked. His description of the 'Ultimate Man' (not the Overman) has always read to me like a critique of blind nihilism. EDIT: Also, right now I'm reading 'Gargantua and Pantagruel' by Francois Rabelais. Great book, completley filthy, filthy stuff. Masterpiece. I reccomend it to anyone, I wish I could read it in French. Was this really written in the 1500's? his sister is largely to blame for it, she took control of all his work when he became mentally ill later in life and she edited (and forged) a lot of his writings. Thx CS, couldn't say it better. I find it funny people consider fascism to be "the far right". How could socialism ever be considered right wing!? But I guess the left right paradigm doesn't make any sense to begin with. Last edited by Mondstar on Mon Mar 22, 2010 12:46 pm, edited 1 time in total. This is a book I read recently.....A great inside look at this tortured soul. Highly recommended. Last edited by LaMarrBruister on Fri Jan 25, 2008 11:03 am, edited 2 times in total. It's actually quite straight forward. Socialists ideally believe in some kind of equality for all citizens and it is that idea which is labelled left wing. The right wing is designated for those who believe in having the majority of the population subserviant to a ruling class. The nazis in Germany in the 1930s may have called themselves socialists but they did not believe in equality for all and that's what made them right wing. Right. The Nazis weren't fascist - they were more akin to fundamentalists. Mussolini was fascist. Yea. Howard Kaylan is interviewed here and there in the book. Damn, losing 2 close, talented friends friends to cancer must stink. 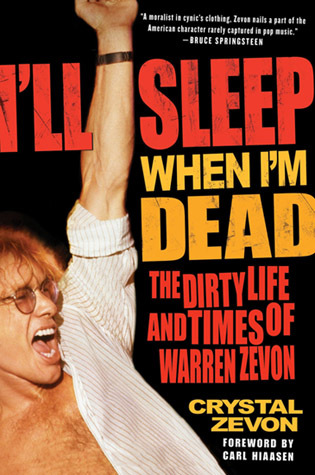 Zevon was a student of Stravinsky, y'know. They became close friends. Zevon wrote a couple of tunes for the Turtles..Outside Chance and Like The Seasons which was the flipside of Happy Together. Dracula - Bram Stoker. I'm in a vampire phase... too much Duckula. The whole left right thing is basically just a muddy mess and there is no clear interpretation of what either means because there are millions of issues and they all arbitrarily seem to fall into a left or right category. I tend to think of left right as a purely economic issue in it's most basic sense, the left meaning pool the wealth, and the right meaning, keep the wealth in private hands away from governments. Basically we've never seen either! We've always been in some degree of a hellish quagmire of tyrannical socialism.